Turkey’s cultural capital is a buzzing transcontinental beauty spot. Once known as Byzantium and then Constantinople, Turkey’s economic, cultural and financial epicentre is also a tourism heavyweight - it was the world’s eighth most visit­ed city in 2016. Istanbul is a wonderful city for snacking, and instead of wasting precious sightseeing time on long sit-down lunches, visitors are advised to hand over a couple of coins for a balik ekmek (grilled fish sandwich) from the boats bobbing near the bridge. Alternatively, grab a kebab or freshly baked simit (sesame-coated bread ring), followed by some melt-in-your-mouth Turkish delight or a square of sticky sweet baklava pastry. So while waiting and planning for your best time to visit Istanbul soon, you can experience the taste of its colorful taste and aroma right here at the heart of Ortigas, Manila. Savour the true flavours of Istanbul at the world’s kitchen, as Marco Polo Ortigas Manila’s Cucina celebrates the capital city’s vibrant taste and sensual aromas with guest Chef Gürsel Keleş from October 3 to 15, 2018. Born and raised in Turkey, Chef Gürsel has always been an advocate of his hometown’s cuisine. His experience ranges from different world-class hotels and restaurants such as Sheraton and The Grand Blue Sky Hotel. He is currently the chairman of Eurasian Chefs Association, and has organized multiple cuisine festivals across Turkey, Germany, Lebanon, and Belgium, to name a few. Twenty years after working in different hotels and restaurants, he opened Fish of North, in 2005 which showcases the finest catch from the sea. Alongside Cucina’s expert culinary team, Chef Gürsel features a menu that transports foodies to the heart of Istanbul. Start the meal with Circassian Chicken Salad, followed by hot-off-the-grill skewers of chicken, red snapper, lamb and eggplant. Signature dishes include Steamed Sea Bass in Paper with Vegetables and Herbs (Kagritta Levrek), Pan-Roasted Lamb with Smoked Eggplant Puree (Hunkar Begendi), and Spiced Chicken with Olive Coriander Relish. Top it all off with the staple Pistachio Baklava (Ore Baklava) for dessert, Candied Pumpkin with Walnuts (Kabak Tatlisi), and Fried Dough Balls in Rose Scented Syrup (Lokma). 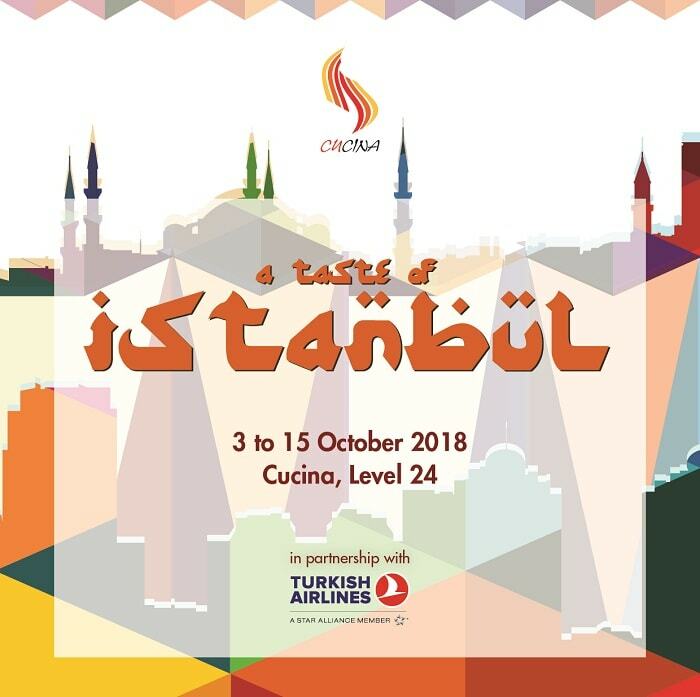 For more information and reservations for “A Taste of Istanbul,” please call Cucina via (02) 720 7777 or email restaurant.mnl@marcopolohotels.com. I'd love to try Baklava and kebab! Would love to visit Marco Polo this weekend just for this! Thanks for the info! Masarap din Turkish Coffee, you should try it! I agree! I have Turkish coffee at home, and OMG nakakabuhay! Seems interesting - I had no idea about Istanbul cuisine. Would try to visit once I set foot in Manila. Soon! Am not sure if there's a Turkish restaurant in Manila (I need info!). Glad that Marco Polo Ortigas hosted this kind of event. I love how you wrote this piece, it's well put together. I am not familiar with Turkish cuisine but from what I have gathered, it is generally Mediterranean so it's, I presume, healthy and light. Thanks for stopping by Ivan! Gladly, Marco Polo and Turkish Airlines, made it possible. Wow I wanna try there too.. Hopefully soon.. I didn't know they had this in Marco Polo! I must dine here soon. Hey Kaycee! Miss you too! Can't believe there's a place like this in Ortigas. I'll visit this with my friends soon! I've been to Marco Polo to take my IELTS exam before. This makes me wanna go back there and try Turkish food! I like Marco Polo, it feels so homey for me and I like the people!